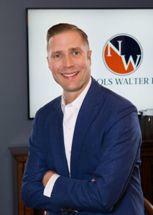 Carl W. Walter II joined the firm in 2009 and became a partner in 2013. He was born in Paducah, Kentucky and has extensive contacts throughout the state. He graduated with honors from the University of Kentucky in 2003 and from the University of Kentucky College of Law in 2006, where he was the President of the Student Bar Association. He is admitted to practice in all state and federal courts in Kentucky and has been asked to represent clients in Tennessee on a pro hac vice basis as well. Carl’s early insurance defense experience was gained though his employment with Boehl, Stopher & Graves, LLP. His early practice was unique in that he was given the responsibility of working up cases from the filing of the case through trial within the first two years of practice. His practice focused largely on general litigation and insurance defense and he gained early trial experience in several complex matters. Through that experience, Carl handled a wide array of cases throughout central and eastern Kentucky, including aviation liability, automobile liability, premises liability, products liability, toxic torts, real estate transactions and general negligence claims. Since Carl joined Wellman, Nichols & Smith, PLLC in 2009, his practice has focused solely on handling and trying medical negligence cases. Carl holds an AV® Preeminent™ Peer Review Rating from Martindale-Hubbell® and has been named a Kentucky Rising Star by the Super Lawyers, an honor bestowed on less than 2.5 percent of all lawyers in Kentucky. He is an extremely talented litigator and trial attorney with an unusual ability to gain the trust of those with whom he comes into contact.